Unroll dough and lay out into two long pieces on a floured board. Slightly roll dough into about a 12 x 4 rectangle. Doesn't have to be neat. 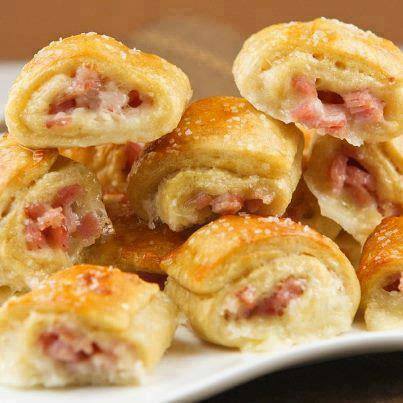 Brush dough lightly with Dijon mustard then sprinkle with ham and top with shredded cheese. With the long side facing you, gently press the ham and cheese into the bottom third of the dough, and roll as tightly as possible, starting with the end that has the filling. Cut into 12 1-inch pieces and transfer to a sheet pan lined with parchment paper. Brush lightly with egg wash and bake in the preheated oven until they are puffed and golden, about 15 minutes. Remove from oven and immediately brush each pretzel bite with melted butter and sprinkle with coarse salt. Serve warm.